ART PLATFORMA MOLDOVA | NGO promoting and strengthening cultural resources in Moldova through lounching and developing a unique cultural space that would cover different aspects of art and culture, such as literature, photography, visual arts, cinema, music. and Ukraine), Russia, Turkey, as well as 3 speakers from EU members. We invite you on 18 July at the opening of the exhibition of documentary photography, «Waiting for better times», which will take place in the gallery of the shopping center Grand Hall The exhibition will showcase the work of Moldovan documentary photographers Ramin Mazur, Dorin Goian, Donika Nelu, Anton Polyakov. The focus of attention of photographers are Moldova and Transniestria: urban areas of Chisinau by Ramin Mazur, rural life by Dorin Goian and Nelu Donika, Transnistrian sketches by Anton Polyakov. 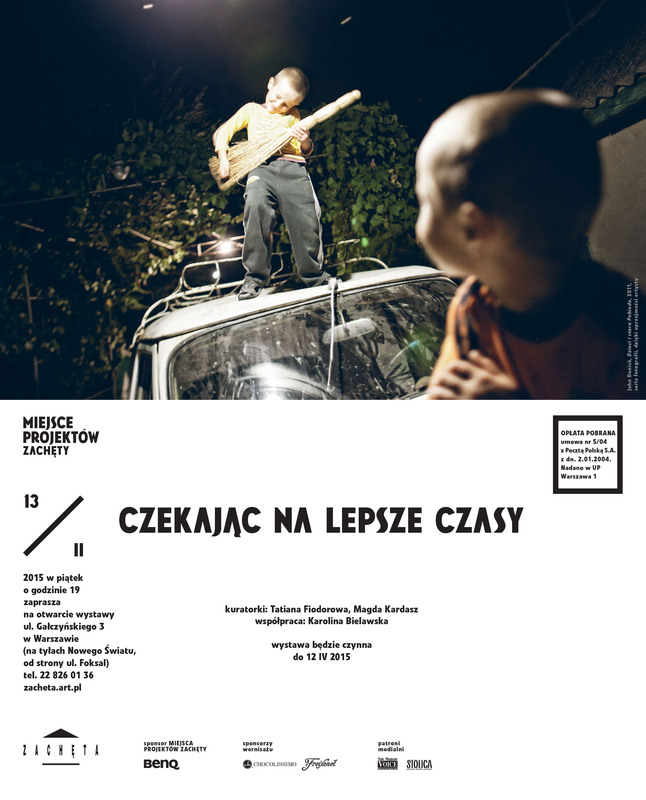 The works of photographers were shown in February 2015 ZACHĘTA PROJECT ROOM in Warsaw. The exhibition was devoted to contemporary Moldovan art, which involved 16 artists from Moldova. The exhibition will be from July 18 2015 to August 12, 2015. 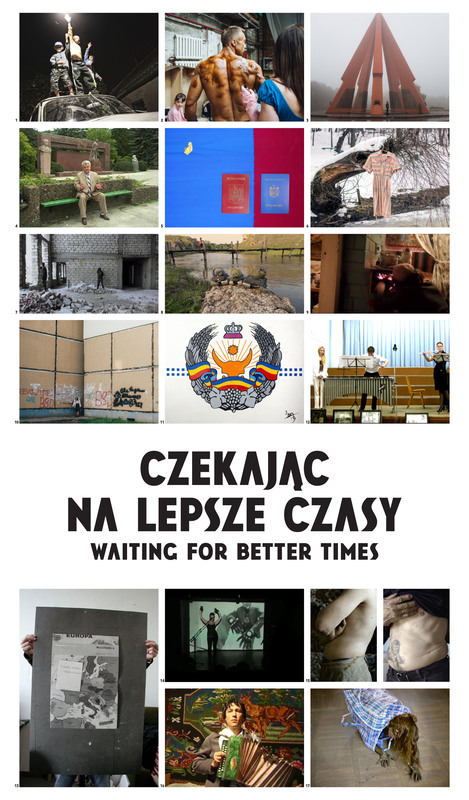 Opening of the exhibition «Waiting for better times» will be held 18 July at 18.00 ,Gallery shopping center Grand Hall, on the third floor.. The exhibition presents photographs, films, performances, works on paper and objects by Moldovan artists of the middle and young generations born and growing up both in the times of the Soviet Union and after its collapse. Contemporary art of the countries of Eastern European is often concerned with political and social issues. This is evidently connected with the dramatic changes that have resulted from the paradigm shift of the transition from socialism to a market economy. The process of the formation of capitalism in Eastern Europe is full of difficult moments and contradictions. This is, of course, reflected in the works of a large amount of artists from the Eastern bloc. Contemporary art in Moldova presents and analyses questions of national identity, contrasts the legacy of the past with today’s problems, and emphasises unresolved economic, social and political problems. Moldova is a former territory of the Soviet Union, lying between Ukraine and Romania. During the 25 years that have passed since the collapse of the Soviet geopolitical space and the emergence of new independent countries, Moldova, as an independent state, has been through complicated political, social and economic changes and upheavals. The democratisation of political life in Moldova, and the development and stabilisation of market mechanisms has been accompanied by the transformation and privatisation of state property, the collapse of the economy and the destruction and degradation of industry, a lowering of living standards and, in the final account, the impoverishment of the country. Because of low salaries and unemployment, citizens of the Republic of Moldova have been forced, either legally or illegally, to emigrate and seek work beyond the borders of the country in search of a better level of life. Moldova has therefore today become a country that exports its workforce: according to statistical information, one in four Moldovans works abroad, in particular in Russia and Western Europe. Moldova, since it is located on the border of zones of geopolitical influence of such global players as Russia, the European Union and the USA, is also subject to active influence from outside. Over recent year Moldova has maintained an official course towards European integration and the modernisation of the country, but within the country one can also witness a rise of internal tensions and the influence of pro-Russian forces. Today, against a backdrop of rising political tensions in Eastern Europe and the unresolved conflict in Ukraine, one can observe in Western societies and media a growing interest in the region of Eastern Europe as a whole, as well as in Moldova, a country which suffered similar geopolitical upheavals in the 1990s at the time of the Transnistria Conflict. Contemporary art in Moldova has developed and develops very slowly and in waves. The artists who at the exhibition represent the first wave of the 90s: Veaceslav Druta, Lucia Macari and Pavel Braila, started their activities through the support of the Centre for Contemporary Art (KSA:K) that was opened in the last decade of the twentieth century. It is from this moment that can be charted the beginning of the process of the emergence and formation of contemporary art in the country as an alternative to the official (conservative) art supported by the Moldovan Union of Artists. Some artists of the first wave, on account of the impossibility of receiving an adequate artistic education or of obtaining relevant knowledge about art abroad decided to emigrate: this concerns Lucia Macari (Holland), Veaceslav Druta (Canada) and Pavel Braila (Germany). Thanks to this emigration they discovered that the main challenge for them is to overcome the chasm dividing the art of the avant-garde of the early 20th century from post-Soviet practices. Some of these artists returned to the country and joined the process of its integration into the world art scene. In their turn, the artists of the second wave presented at the exhibition — Alexandru Raevschi, Ghenadie Popescu, Tatiana Fiodorova, and Dumitru Oboroc — grew up in the second half of the first decade of the 21st century, in a time when the internet had made available a wide array of possibilities of gaining knowledge and achieving creative development. The 2000s were also a decisive moment in the inclusion of Moldovan contemporary art in the international context: in 2002, Pavel Braila participated in the prestige exhibition of contemporary art documenta 11 with the work ShoesforEurope, and in 2005 Nicoleta Esiniencu in the frame of the Romanian pavilion at the 51st Art Biennale in Venice showed her work FuckyouEurope. At the exhibition are also presented representatives of the new wave of the second decade of the 21st century: experimental young painters, photographers, documentalists and composers: Valeria Barbas, Tusia Jurminskaya, Ramin Mazur, Anton Polyakov, John Donica, Dorin Goian, and Stefan Esanu. While discussing the overall transformations, we should bear in mind that Moldova currently still lacks a proper artistic infrastructure of galleries and museums: moreover, there is not a single higher education institution providing an education in this field or where one could train for a career as an artist, curator or art critic. Contemporary art is not supported by the state. In Moldova there has never been art market and this is still true today: the demand for contemporary art is close to non-existent. Contemporary art in Moldova is supported by a number of institutions: the Chisinau Centre of Contemporary Art (KSA:K), and Young Artists Association Oberliht, Teatru Spalatorie and NGO Art Platforma, supported principally by grants from the West. After 20 years, Moldovan contemporary art still remains a marginal phenomenon, little known not only to viewers from the West, but also to Moldovan society. However, despite the difficulties, the organisations mentioned still make considerable efforts aiming at bringing about changes in the process of artistic education in Moldova. which carries out unusually meaningful activities. As far as the development of documentary photography amongst the young generation is concerned, here an important role is played by NGO Art Platforma which realises exhibitions and master classes. The presentation is supplemented by the projects of two Polish artists: one of photography by Agnieszka Rayss and the other of film by Dominik Ritszel, created during a stay by these artists in the Republic of Moldova. “Waiting for Better Times” is a group exhibition presenting photographs, videos, drawings, and objects by young- and mid-generation Moldovan artists, as well as two projects created in Moldova by Polish artists. The selected works in various ways illustrate the situation in Moldova, a country of complex identity, undergoing transformation, receiving influences from both the east and west of Europe, stretched between post-Soviet sentiments and aspirations of social and economic development. The works show urban and rural landscapes, portraying people and their living conditions, expressing their hopes and frustrations. Often they refer to cultural (including folk) traditions or social issues, or metaphorically present the country’s political problems. NGO promoting and strengthening cultural resources in Moldova through lounching and developing a unique cultural space that would cover different aspects of art and culture, such as literature, photography, visual arts, cinema, music.